Boygenius is the American recording project that wants to celebrate the folk alternative through the sound of Julien Baker, Phoebe Bridgers and Lucy Dacus. 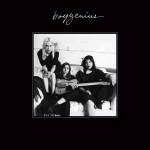 Produced by the Matador Label, the first Boygenius' EP is a moment of metaphysical music. In the twenty-one minutes of the album the three artists harmonize their voices, placing them at the center of listening. Tree young waves of American folk contribute to the realization of a treasure chest of notes. In Bite the Hand the delicate synchronization of voices and instruments welcomes the listener in the Boygenius' universe. Guitars and drums are the backdrop to a chorus that enchants us. Wings of notes fly over the Creation. The Souvenir is a symbol of memory and nostalgia. Why do we have to fall in love if our feelings come to an end? Singing what is left in the corners of the soul is a therapy for the days that remain to be lived. Salt In The Wound is the metaphor of a still present pain that fears to renew itself. The announcement of words of a distant memory is carried by the electric guitar and the piano which invent a dance of notes. Visionary landscapes spread around the three artists between overwhelming emotions and female wisdom. The grit of the voices alternates with the delicacy of the themes. One can not surrender to the resistance of life's power. Ketchum, ID begins with a silent movement of strings that joins the echo of a female voice. Singing this song in the evening, before the darkness falls on your corner of the earth, will allow your to welcome the night in your most imperceptible emotional sphere. Three sweet and full of quality girls who come from American lands. Julien from Tennessee, Phoebe from Pasadena and Lucy from Virginia. Daughters of simplicity, authors of a musical perfection, have made a record product of considerable importance. By putting the torn and recomposed female feelings at the center of their artistic plan, they teach us to face the labyrinth of our heart with a pure attitude. The perfectionist vocals of the three singers raise the six songs towards the qualities of an angelic choir. They put not only their voices at the center of the songs, even the instruments are protagonists, first of all the guitar.